A custom power wheelchair will help you get around your home and community more easily. Transporting your wheelchair from place to place, however, can be a challenge. You can’t just set your power wheelchair in your trunk or attach it to the back of an average-sized vehicle. Custom power wheelchairs are bulky and weigh around 300-350 pounds. Below you will find the most common options for transporting custom power wheelchairs. ​Note: If you have the strength and energy to transfer and sit comfortably in a simple transport wheelchair for an extended period of time, you may wish to use your custom power wheelchair at home and move about your community in a light transport wheelchair that can fold up and be stored inside your vehicle. Purchasing a used or new handicap-accessible van (also called a conversion van) is considered the ideal option by many. 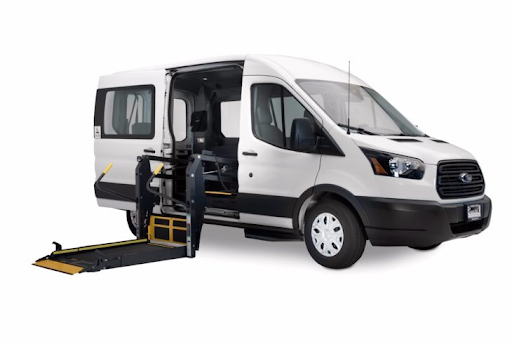 With a conversion van (often a minivan), you can drive your wheelchair straight inside (using a lift or ramp) and stay in your wheelchair during the ride, thus avoiding the stress and hassle of transferring in and out of your wheelchair every time you go somewhere. Conversion vans will have additional clearance and a system that safely secures your chair in place during transit. Generally speaking, you may be able to find a used conversion van for around $10,000-$20,000. There are companies that buy new vans, convert them, and sell them new, but that option could cost you $25,000-$50,000. You can try buying a new minivan and paying a company to convert it, but the conversion alone might cost you $20,000. We recommend asking your local ALS community—including your ALS Association or MDA chapter and support group—if anyone knows of a used, wheelchair-accessible van for sale. When people with ALS pass away, their families often look to sell their conversion vans back to someone in the ALS community. You can also ask if anyone knows of local organizations or websites that list used handicap-accessible vans for sale. Learn more about purchasing a handicap-accessible van. Veterans: Learn about VA grants for wheelchair-accessible vans. ​If you just want to rent a wheelchair-accessible van for short-term local or regional travel, companies such as Wheelchair Getaways provide rentals. Ask your local ALS Association or MDA chapter about van rentals in your area. Wheelchair lifts transport wheelchairs on the outside of vehicles. The weight of the lift (around 75-100 pounds) plus the weight of the power chair means that you will need a vehicle capable of carrying the extra load. If you have such a vehicle or want to purchase one, a wheelchair lift may be a good option for you. However, keep in mind that using a lift means you will have to transfer from your chair to a passenger seat and back again every time you go somewhere. Before making any big purchase—whether a van, car, truck, or lift—always, always consult with your assistive technology professional (ATP), durable medical equipment (DME) company, physical or occupational therapist, and local ALS Association or MDA chapter. Unfortunately, some families have lost a significant amount of money by purchasing new or used vehicles or systems that were then unable to transport their power wheelchairs. Before making any purchase, you first need to know the exact model and dimensions of your wheelchair. Then you need to ask about the tongue weight of the vehicle, which is the amount of weight it can support. A regular sedan, for example, will not be able to carry a lift and a power wheelchair. Before making your purchase(s), discuss your plan with your team of professionals to make sure you have taken all considerations into account. ​One of the best ways to save money in general is to look for used vans, trucks, cars, lifts, and ramps. ​Another option is using a long, external ramp to get your power wheelchair into the back of your van or truck. (This is different than having a built-in ramp on a wheelchair-accessible van.) Keep in mind that this option—like the lift option—requires you to transfer from your wheelchair to a passenger seat and then back again every time you go somewhere. Your companion will need to know how to set up the ramp and drive your wheelchair (without you in it) up and into a secured position. If having your own wheelchair-accessible vehicle is not an option, you may be able to get from place to place—while staying in your wheelchair—by using public transportation or private ride services. Talk with your local ALS Association or MDA chapter to find out what options are available in your community. Regular public buses, for example, should have wheelchair lifts as well as mechanisms that secure your chair in place during transit. Public transportation systems, private transportation services, and cab companies often have handicap-accessible vans or buses that can pick you up at home and drop you off at your destination. Learn more about transportation options.